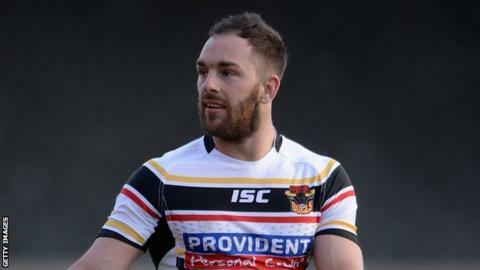 Luke Gale scored 28 points, including a hat-trick of tries, as Bradford Bulls thrashed Oldham Roughyeds to sail into round five of the Challenge Cup. The scrum-half touched down twice either side of Brett Kearney's try before Kenny Hughes crossed for Oldham. Elliot Kear made it 24-6 at the break following Dale Ferguson's 40-yard run. Adam O'Brien, Danny Addy, Adam Henry, Jamie Foster and Ferguson all went over in the second half, with Kear scoring his second and Gale his third. Gale also kicked eight goals, as the gulf in class between the Bulls - who lie bottom of Super League - and the Championship One side was evident from the start. Francis Cummins' side will host Super League rivals Catalan Dragons in the fifth round of the competition. "Jamal's burnt a few emotions this week and it was good for him to get back on the field. "He's been training on his own but there's nothing like playing and he was blowing a bit." "The game itself was always going to finish with that kind of scoreline but the effort was outstanding and some of the stuff we did with the ball was very good. "I wanted them to go and test themselves against a Super League side and enjoy it and that's what they did." Bradford Bulls: Kearney; Wood, Purtell, Henry, Kear; Addy, Gale; Manuokafoa, O'Brien, Walker, Ferguson, Blythe, Donaldson. Replacements: Foster, Roberts, Conroy, Fakir. Oldham Roughyeds: Whitehead; Agoro, Wood, Gee, Bloomfield; Palfrey, Robinson; Ward, Whitmore, Boults, Crawley, Langtree, Hobson. Replacements: Joy, Mooney, Hughes, Tyson.